For years Madden has been a decent game that could be enjoyed by overlooking its considerable flaws and deficiencies which have generated frustration yet avoided game-breaking status. For many that was possible and the value was there, for some it was still too much to get past. That really hasn’t changed with Madden NFL 15 which has improved in several areas of need but come up short yet again in others. What’s different this time is the number of options that change the way you can play for the better. Continue on to check out what I’ve identified as the best and the worst after 15 hours of playing Madden NFL 15. There are obviously more to come as I’m not able to touch on issues people have seen with simmed stats or play calling completely yet as a few examples. A full ‘Hits and Misses’ review will follow late this week or early next week. It’s been a long time since a feature has completely surprised me in how much the functionality changes the way a game is played. 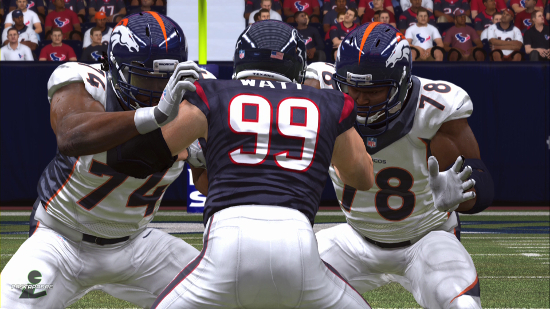 Never would I have thought camera angles could have such impact as they have with the implementation in Madden 15. I had no desire necessarily to change away from the traditional camera so when the announcements were made none of it resonated with me. Even when games like NCAA Football added them I would generally stick to the defaults and having tried specialty ones like “Player Lock” in that series a flipped option on defense was assumed to be virtually unplayable and a pointless offering. The defensive camera in Madden keeps the action in front of you and that can actually be advantageous as you get the sense you’re containing big plays. It’s probably most natural for controlling a defensive lineman or a blitzing player but even linebackers and safeties can be utilized effectively in many instances whether in man, zone, or spying. Rare is the occasion where a player gets behind the last line of defense and off-screen and switching who is controlled during a play isn’t disorienting at all. Situationally the best time to use the defensive camera may be in third and long where you can get at the QB and rush a throw or pick up the sack. I’ve had less success in short or medium yardage but that is probably not the fault of that camera. The D-Pad lets you switch between camera angles before every snap and I’ve found myself changing it on an almost play-to-play basis. When running up the middle I like the zoomed in perspective. When passing it’s the traditional camera or one notch out. When running to the outside it’s one of the two zoomed out options and screen plays are all the way zoomed out. Then I get crazy and for some reason like the broadcast camera for kick and punt returns. The only problem I’ve had is that the CPU doesn’t give you any time to change the angle on some kick returns. Everyone will probably have their own set of preferences but I suspect those aware of the options will get creative in using them to their benefit. Though the pop-ups might look gimmicky controlling a defensive lineman is much more enjoyable and effective due to the new controls. It’s fun to anticipate the snap (and the good QBs will try to draw you offsides and it’s worked on me a few times) and hit the left trigger to get the best jump. Then once engaged you can hit the button that pops up to try and get off the block and/or use the stick to try and get around them. Sometimes it’ll work and others it won’t – it’s pretty satisfying when it does and impressive when it doesn’t. From the defensive camera angle especially the double and sometimes triple teams that you’ll see are really neat. The problem might be the number of sacks racked up. This seems more related to the QB’s willingness to eat the ball rather than get rid of it. It’s not solely on these controls making it easier to get after them. Ndamukong Suh is on pace for 32 sacks (through eight games he had 16) in my franchise season and I control him on only maybe half the snaps. In order to put up realistic scores and stats games are going to need 10+ minute quarters. That’s not necessarily a bad thing. The games are playing out more true-to-life but the number of possessions aren’t adequate with shorter quarters. With the defense improved you’ll be punting more than in the past plus the CPU is converting at a high rate on third downs which keeps the clock running. Exploits from last year have really been cleaned up. Running to the outside isn’t going to always work. In my franchise currently Reggie Bush has 4.7ypc and Joique Bell only 3.2 yards. Getting the running game going isn’t easy but I’ve started to have more success as of late. “Money” routes in the passing game have too been limited though I’m sure some will be found as far more effective than others (I’ve already learned a number of routes to pretty much avoid). The crowd-sourced play calling already is showing some trends on what tends to work and what doesn’t. There are also more options to counter the opposition when on defense which are great to have though I haven’t been able to fully evaluate yet. The CPU is far more challenging on All-Pro. I started my franchise season 3-3 though I’ve now won the last 4 games to go to 7-3. Only 2 of them have been won by a big margin. Unfortunately stats still seem to be a problem. In the franchise my Lions have the #1 defense and #32 offense. Despite the success of lower-tier quarterbacks (see the dislike section) even their player skills are shining through well. The difference between taking on Aaron Rodgers and Matt Flynn is huge as it should be. QBs are playing to their strengths with Cam Newton running the ball a lot, Johnny Manziel looking uncomfortable in the pocket and scrambling around frequently, and Drew Brees sticking to the pocket and making throw after throw on the money. Adrian Peterson is difficult to bring down, far more so than most other running backs. The versatility of a Reggie Bush is fun to utilize. Ndamukong Suh or J.J. Watt are monsters and can get to the QB consistently especially if you are controlling them. Lower rated lineman will not have that kind of impact. More talented receivers will make some spectacular catches and adjust to the ball better but otherwise don’t separate themselves as well as QB, RB, or DL. Kicking is super easy even with the worst ones but not many field goals are missed these days in the NFL. Other positions, whether it be offensive line or linebacker or defensive back, are a little more difficult to evaluate over a constrained period of time so we’ll have to see how they shake out. Another unexpected area of appreciation comes with the new crowd-sourced play call suggestions. This uses telemetry collected from all games of Madden being completed to present a handful of plays that have been successful in the current situation. It even shows why the play is being brought up with data indicating its success rate and average yards gained. This has proven much more useful than “GameFlow” and for the most part appealing plays are floating to the top. Hopefully over time there will be more variety rather than less as people begin to identify what tends to work too often. The only problem with the community suggestions are that you get defaulted to it after every play and have to back out to get to other play-calling options. In the lead-up to release EA Sports made a big deal out of how quarterbacks would play more to their skill level specifically when it comes to accuracy. That poor QBs would struggle because of it. Unfortunately this hasn’t completely turned out to be true. There are the occasional inaccurate throws yes. You’ll maybe see one or two of those a game. They will also throw some picks. However regardless of who the QB is they will most likely complete 70-90% of their passes. Christian Ponder, Matt Flynn, Geno Smith, and Johnny Manziel are some of those who have done this to me. They rarely take shots deep but will consistently find receivers in the short to intermediate range and move the ball down the field showing especially good decision-making skill on third downs. While the defense can get good pressure on the QB and rack up the sacks, the actual presence of pressure seems to do nothing to affect most throws. The QB will either eat the ball and take the sack or deliver an accurate pass. One of the biggest problems with Madden has been how poorly it represents one-on-one coverage down the field and that hasn’t changed this year. 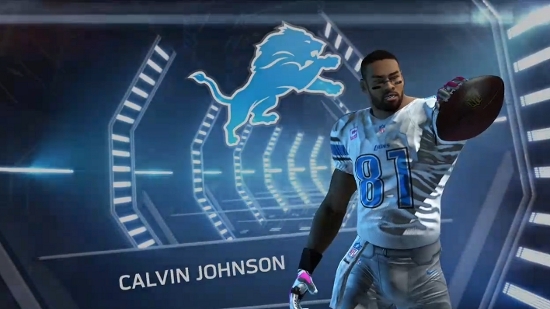 Even with guys like Calvin Johnson throwing a bomb to them when single covered is just asking for an interception. Receivers don’t use their body to position for the ball and corners playing underneath leap for the picks practically uncontested. Quarterbacks, even those with big arms like Matthew Stafford, consistently underthrow the deep ball even when attempting to lead the receiver. I could count on one finger the number of times I’ve overthrown the receiver on a deep ball. Receivers are simply too passive in these situations. You’ll recognize the familiar “putting up their hands to make a catch on a ball that won’t be getting past the defender” animation. It’s almost like the defense knows this too, because Megatron and other elite receivers are left in single coverage far too often. It’s incredibly frustrating knowing that can’t be exploited because the risk of being picked off is too great despite any spectacular catches and incompletions mixed in. EA did a lot of good things to make Madden more sim this year, even slowing down the ability to make multiple hot routes, but going no-huddle seems poorly represented. Players are able to get to the line of scrimmage from all over the field, lined up properly knowing the play (telepathically it seems unless you want to pretend they called multiple in the last huddle) and set for the snap consistently in 4-5 seconds. This happens so fast and with the camera on the QB rushing to the line that on defense you have maybe half a second to change your play or camera angle. The CPU snaps it immediately, while maybe user opponents would adjust the play at the line. It’s not realistic even for the most up-tempo of offenses. The play review/challenge system continues to have its frustrating limitations. Plays that should be automatically reviewed – those after touchdowns, turnovers, or under two minutes – are often not despite appearing to be close calls. Of course the user can’t manually challenge those because they are supposedly always under review. Even if it’s going to be confirmed there should be more of the reviews seen. This year it has been amplified by players seemingly just dropping the ball immediately after knowing they’ve triggered a score despite it appearing they didn’t hold possession on catches long enough in the end zone or complete the process on the sidelines. There also remain many instances where you’d like to challenge, and should be able to do so, but inexplicably the option is “locked” in the menu. It seems nothing was done to improve commentary this year as many watching the streams have noted they haven’t identified anything at all new. The pair of Jim Nantz and Phil Simms are often completely wrong with their facts or analysis and Simms is just maddening to listen to – like real life! There is very little if anything touched upon when in Franchise mode as to stats or standings or storylines. The presentation also barely improved by adding a single “upcoming schedule” or “division record” graphic that shows up in the fourth quarter and disappears after about two seconds. The halftime show is simply about your game’s top plays rather than others that have taken place or are “in progress”. Still too much of a disconnect between the happenings in a franchise and while playing the games.